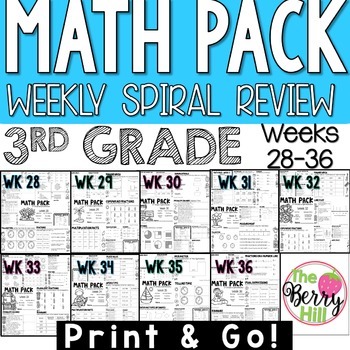 Each Math Pack is a 8-10 half page packet of 3rd grade math skills that can be used to spiral review throughout the year. Spiral reviewing is a best practice to ensure students continue to practice skills already taught earlier in the year! Click HERE to see a preview clip of The Math Pack! You will download a PDF that will give you a link to all of the Math Packs in a Google Shared Folder. Click the link and request access. I have done this to prevent sharing of this large resource without proof of purchase. Thanks for understanding!